Chalet des Alpes in Wengen, has stunning views of the Jungfrau and the Lauterbrunnen Valley. 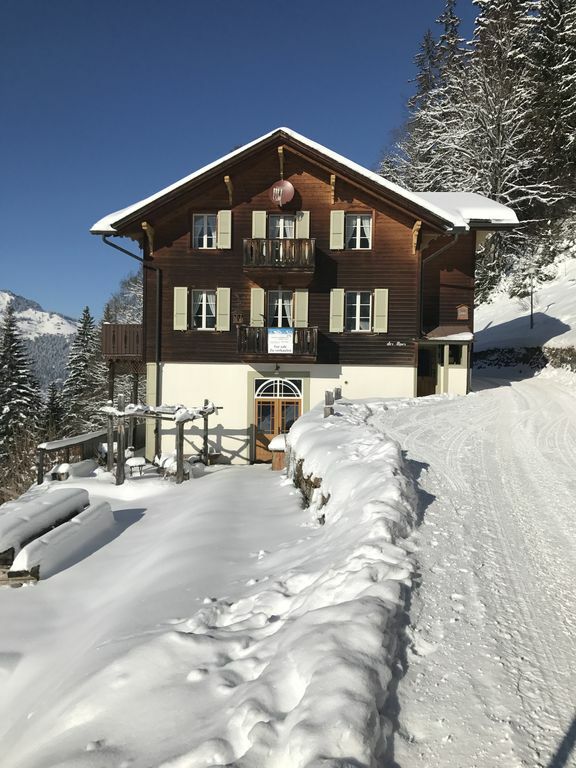 The chalet is located in a beautiful and peaceful location in Schiltwald, it is very close to the famous Lauberhorn World cup finish area and the Innerwengen fast quad-chair ski-lift, this is just around the corner (less than 5min walk in skiboots). This charming chalet sleeps 8 persons. Master bedroom with balcony & ensuite. Breathtaking views of the picturesque Lauterbrunnen valley. Fully fitted granite kitchen - dishwasher/fridge/halogen hob/oven. -heating & hot water. Use of washing machine, tumble dryer. Relax in peace in this beautiful location,enjoy fresh air and especially long sunshine in winter, in summer enjoy hikes and mountain walks with different difficulties. Plenty of sign posted hiking trails as well as fantastic views the Eiger, Mönch and Jungfrau. We live in Wengen with our two children. It is such a special place to live.We enjoy welcoming our guests and sharing our local knowledge. Whether you visit in the spring or summer you will find some fantastic walks and beautiful views at every corner. In the winter we are lucky enough to share our passion with all our guests at Ski Set, Wengen and when we are not working in the shop we love to be out skiing! We are a family who love to ski, between us we have lots of knowledge about all the ski areas, affordable restaurants up the mountain and places to go when you just want to enjoy the mountains. We purchased the property because of the locations, a short walk from the main centre of Wengen, the close proximity to the Lauberhorn finish area and Innerwengen chair lift. The beautiful location and convenient position of the chalet. The chalet is situated in a lovely part of Wengen called Schiltwald, with very pleasant neighbours and a lovely atmosphere. In Tracy's appartment eight people can find place. Kitchen and saloon are well equiped. And there is even a cave to put the skis. In Tracys appartment you can find all you need to spend your holidays. For people who like skiing, winter and wonderful mountains, Wengen is the favourite destination. From Tracy's home, the walk takes 5minutes to catch next skilift. To get to the village, the walk takes about 15minutes. If we are in a hurry, we always can call Rüedu the taxidriver - a real legend of the Berner Oberland. We came the last two years to Tracy, and we have already booked the appartment for 2017. Any questions? Etage met een uitzicht ! Nette chalet op 30 min. loop afstand van Wengen station (volgens de eigenaar 15 min.). Een pittige wandeling met de koffers, maar je kunt ook voor een taxi kiezen (kost +/- 25 Chf). Voor ouderen mensen die iets minder te been zijn is deze locatie niet echt een aanrader ivm de dagelijkse wandeling die gemaakt moet worden om ergens naar toe te gaan. Wij hadden de bovenste verdieping die voor 6 tot 8 personen is. In onze ogen is de woning voor max. 6 personen. (een extra slaapkamertje voor 2 personen zit op de overloop buiten het appartement) Het glaswerk is zeer minimaal, voor 8 personen heb je zeker een tekort aan glaswerk. De luiken aan 1 kant van het appartement ontbreken en er hangen geen overgordijnen waardoor je dus 's morgens heel vroeg gewekt wordt maar wel met een super uitzicht . We hebben echt super genoten van al het moois in en rond om Wengen, het is een ideaal punt voor de diverse uitstapjes. Conclusie: Net chalet, mooi uitzicht in een super omgeving. Een aanrader voor de jonge wandellaars. A 2010 review of the the top 10 best ski resort views in the world said of Wengen 'It is one of the worlds most spectacular regions. The views from almost every point in Wengen are awesome in their majesty.' The ski area of Wengen is where the Lauberhorn World Cup downhill ski races and a summer walking/climbing resort. The village sits at 4180 ft (1274m) below the massive peaks of the Eiger, Monch and Jungfrau. The highest train station in Europe at 11333 ft! Wengen is not new, the area around Wengen has been visited and inspired by many famous people - Mendleson, Wagner, Byron amongst them. Byron composed his poem Manfred captivated by the view of the Jungfrau from Wengenalp. Turner painted the Stubach falls in Lauterbrunnen possibly due to the beauty of the sight of the water turning to mist and glinting in the sun as it falls nearly 1000ft. This is the 12th highest waterfall in the world. The area is a World Heritage Site - the only Swiss ski area that is - it is stunning. Ski: There are three grades of piste In this area - blue, red and black. The blues are nice 'cruisy' runs like the green gradings you might find in France and can be often be summer roads. The reds are also quite relaxing with only a few blacks. There is also plenty of off-piste skiing and some lovely tree-lined routes lower down, an ideal area for bad weather skiing in trees . A great snowpark is at First for the tricksters amongst you. Generally the area is very easy to navigate with all slopes from Mannlichen and Kleine Scheidegg and the 'First' area heading toward Grindlewald, where cable cars or trains bring you back up the mountain. Over on the Murren side there is plenty of great skiing and again, here is the famous 'James Bond' Piz Gloria revolving retsuarant, with train or cable cars allowing you to return even after the pistes have closed. It is rare to find a big queue for any lift. There are also some great sledging runs, including 15kms from Bussalp down to Grindlewald. 30% non-refundable deposit to secure the booking. - CHF300 cash(or agreed £/€ equivalent) damage deposit payable at the time of arrival. Paypal also accepted. Prices are based on 8 guests, Please ask for discount in quiet periods spring,summer & winter - Balance of payment due 8 weeks before arrival date. - A Local agent may charge for key collection if outside working hours. - Cancellations within the 8 week period prior to booked arrival date will be refunded as follows: - Full refund of damage deposit. - Cancellation over 4 weeks and up to 8 weeks prior to booked arrival date, 50% refund of the difference between the full cost and the deposit (e.g. for a CHF2200 booking, refund will be CHF770, etc). - Cancellation 0 to 4 weeks prior to booked arrival date, no refund other than damage deposit. - Visitor tax needs to be paid locally at the Tourist Office (about CHF3 per adult, per night and 1/2 for children). In return for this tax you will receive a Visitor's Pass entitling you to a discount for some activities and excursions in the area. There is an extra charge of CHF260 for final cleaning, and CHF36 per person for bed and bathroom linen. This is performed by a local company and the owner will arrange. Check-in time is 1600 hrs (or later) on the day of arrival and checkout time is 1000hrs (or earlier) on the day of departure. This is to allow chalet preparation for subsequent guests, so promptness is appreciated. - Please note: Only taxed (grey) garbage bags are legally allowed to be used. Two bags will be left for your convenience and additional bags are available from the supermarkets if required. There are recycling facilities for glass, tin cans, and plastics, so the volume of taxed garbage can be made very small and therefore additional bags will probably not be necessary. There will also be a week's supply of dishwasher tablets left. In this age of excessive utility costs and environmental concerns, please use the dishwasher efficiently.